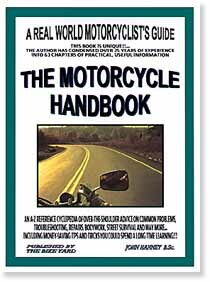 This is a unique reference book that will save you time, money and problems and add years to your motorcycle expertise instantly!! 63 interesting chapters of valuable advice, tips and trade secrets that are illustrated with 128 detailed pictures!! Over 25 years experience in riding repairing and retailing motorcycles is behind the information in The Motorcycle Handbook. The Focus throughout the book is on solving (and avoiding) common problems, saving you money and increasing your safety. If it was worth writing about, it's included in the book! !